Now is a rewarding time to harvest from the garden! This week we started harvesting our Crimson Sweet watermelons. At the beginning of July our Sun Jewel Asian melons started coming in, and somewhere in between then and now, our Kansas muskmelons (usually called cantaloupes). For new growers: “full slip” means a gentle nudge with your thumb on the melon where it joins the stem will dislodge the fruit. “Half slip” is an earlier stage where you need to cut or break about half of the thickness of the stem. harvest your melons at half-slip if you are going away for the weekend, or you worry the groundhogs will get it if you don’t. But if you are harvesting to eat right away, harvest at full slip for best flavor and aroma. We like Kansas muskmelons. They are an heirloom variety with really good flavor, fine texture and enough sturdiness to stand up to humid weather and variable rainfall. The oval fruits are sutured (ridged) and moderately netted, averaging 4 lbs. They ripen almost all the way out to the rind (not much waste!). Kansas also has good resistance to sap beetles that can destroy fruit of other varieties. It needs 90 days from transplanting to maturity. Pick these at full slip, and be sure to inhale the aroma at the stem end, as you carry them to the table. We buy Kansas from Southern Exposure Seed Exchange. Crimson Sweet watermelon is the only one for us! It has the best flavor, though the pinky-red flesh might lead you to think it’s not ripe, compared to very red-fleshed varieties. We harvest ours from around 7/25 (75 days from transplanting) to the end of August. 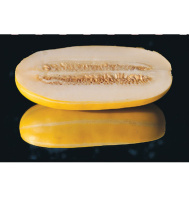 There is a 10-14 day period of peak ripeness for each variety. We hope not to be still harvesting in September. 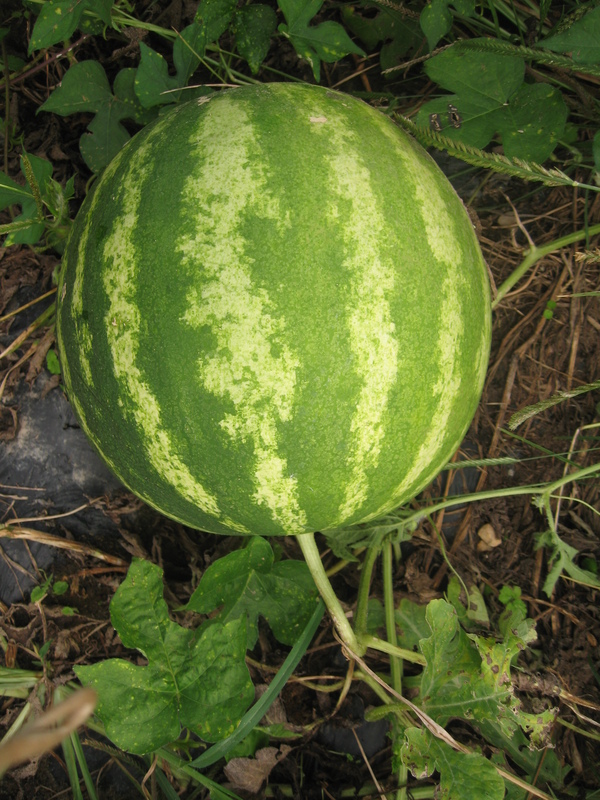 We save our own watermelon seed and select for earliness, flavor and disease resistance. We sell it via Southern Exposure Seed Exchange. A major factor affecting the taste is the skill of the harvester in discerning ripeness. The first sign we look for is the shriveling and browning of the tendril on the stem directly opposite the watermelon. If this tendril is not shriveled we walk on by. Next we slap or knock on them. According to Southern Exposure Seed Exchange, when a watermelon is ripe, it will have a hollow sound when you thump with your knuckles: it sounds like thumping your chest. If it sounds like knocking your head, it’s not ripe. If it sounds like hitting your belly, it’s over-ripe. Lastly, we do the “Scrunch Test”: put two hands (heels together) spread out across the melon, press down quite hard, listen and feel for a scrunch – the flesh in the melon is separating under the pressure. Rumor has it that it only works once, so pay attention! Other growers with other varieties use different ripeness signs, such as the change in color of the “ground spot” (the area touching the ground), or the change in rind texture from glossy to dull. I like to cut the melon stems with pruners, but some people break them off. Watermelons need gentle handling, as do the vines if you will be returning to harvest again. After harvest, we set the melons out to the side of the row for pickup. This gives time for sap to start to ooze out of the cut stem. If the sap is red or orange, the melon is ripe. 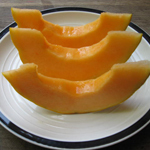 If it is straw-colored, the melon was cut too soon. This is useful feedback for new crew. Watermelons can store for a few weeks, but then flavor deteriorates. We store ours outdoors in the shade of a building or a tree. Rotating the stored stock is a good idea. (They could be dated with a grease pencil/china marker). The ideal storage temperature is 50-60°F (10-15.5°C), with 90% humidity.